In August, Housing residents with signed contracts are invited by email to select a specific date and time window for moving in between Wednesday, August 30, Thursday, August 31 or September 1. It’s not too late to have your student sign up for a time slot. Students participating in Michigan Learning Communities should plan on arriving on Wednesday, August 30, and your time slot choices will be on that day. Keeping to your time slot helps us make sure we’ve got enough spaces for your car, as well as enough volunteers to assist you when you arrive. It also keeps the lines a little shorter than they would be otherwise. Many students are in other programs, such as ROTC or Marching Band, that require them to be on campus earlier -- check with that program for details. 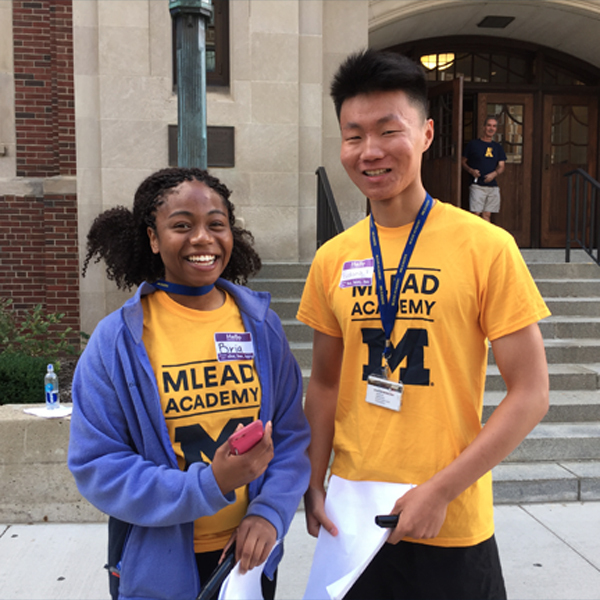 Students arriving between August 30 - September 1 will find ready to meet them a team of MLEADers, our amazing dynamic maize-shirted student move-in volunteers! Your MLEADers will help you unload, pack your things into big bins on wheels, and help you wheel everything up to your room for you. We've got this. Don't forget to download your unloading permit. Print it and stick it in the windshield of your car. It notifies our officers that you’re ready to be directed to an unloading space. If you’ve selected a time slot, then the time will be right there on your permit. You can also download and print campus move-in maps with the best routes marked. Pull up to your building for unloading. Budget only about 30 minutes for this, as all you need to do is get things out of your car. View more details about on-campus move-in. And check out our list of what to bring to campus.